When it arrived in 2006 the third generation Clio went straight to the top of the class, being voted European Car of the Year. 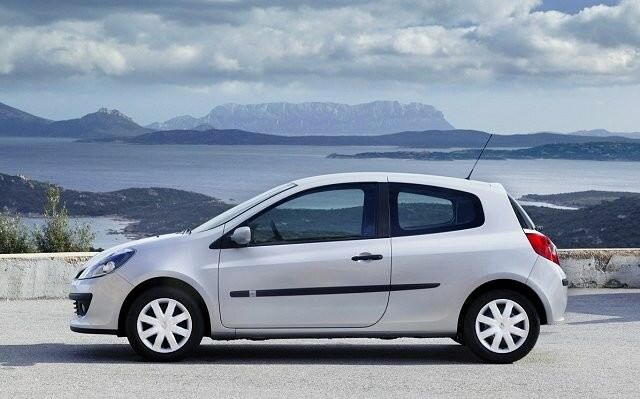 When it arrived in 2006 the third generation Clio went straight to the top of the class, being voted European Car of the Year. Larger and heavier than its predecessor, the Clio has nearly outgrown the supermini class, though it is also incredibly safe and gained a five-star Euro NCAP rating. Spacious, cheap to run, good looking with plenty of availability on the used market it makes for a sensible family run around. Originally launched as a hatchback with three or five doors, a practical Sport Tourer (estate) was launched as well - though it's very rare in Ireland. Even the three-door is pretty spacious though, and the hatchback boasts a 288-litre load space with the rear seats in place. There’s a confusing array of trim levels for the Clio, including Expression and Dynamique models - whatever car you choose get the highest specification you can for your budget. Special editions were a favoured Renault option as well, so look out for such things as Ripcurl, Monaco (with its luxury specification) and the latest Night and Day models. The engine range is a little more straight forward, with a handful of diesel and petrol options to choose from. In 2007 the 1.4-litre petrol was replaced by the turbocharged 1.2 TCE unit, and automatics came with a 1.6-litre engine. Otherwise there’s a choice of five- and six-speed manuals depending on the age and specification of individual cars. If you want a diesel then the 1.5 dCi is a great choice too. And for performance fans the Clio is available in Renaultsport guise, which is generally hailed as one of the best hot hatches ever available. The range was facelifted in 2009, and these later cars are worth searching for with better equipment and build quality. There’s plenty to choose from on the used market, so values are in the buyer’s favour. Post-2009 cars are worth the extra, not just for the looks but for the level of standard equipment as well. We’d opt for the excellent 1.2 TCE, which combines lively performance with excellent efficiency, though the 1.5 dCi isn’t a bad unit either. There’s little difference between the three- and five-door body styles other than ease of accessing the rear seats, but look for the highest specification you can. It’s by no means the best supermini to drive, nor is it the best looking, or the best built, but then no car in the sector is best at everything - not even the Ford Fiesta. However, the Clio is such a consummate all-rounder it comes close to many, and makes a very sensible used choice. You’ll find loads of space - and on the whole standard kit - inside and being such a popular new model makes it readily available on the used market.